تأثیر انگیزه درونی و بیرونی بر انتقال دانش (مورد مطالعه: موسسه عالی آموزش و پژوهش مدیریت و برنامه‌ریزی). رهنورد, رامین. (1394). تأثیر انگیزه درونی و بیرونی بر انتقال دانش (مورد مطالعه: موسسه عالی آموزش و پژوهش مدیریت و برنامه‌ریزی).. مطالعات منابع انسانی, 5(18), 31-48. رامین رهنورد. "تأثیر انگیزه درونی و بیرونی بر انتقال دانش (مورد مطالعه: موسسه عالی آموزش و پژوهش مدیریت و برنامه‌ریزی).". 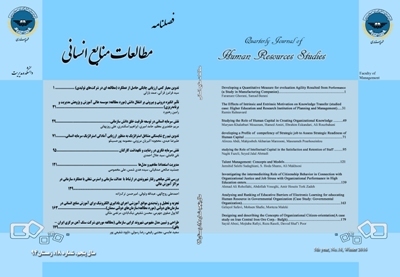 مطالعات منابع انسانی, 5, 18, 1394, 31-48. رهنورد, رامین. (1394). 'تأثیر انگیزه درونی و بیرونی بر انتقال دانش (مورد مطالعه: موسسه عالی آموزش و پژوهش مدیریت و برنامه‌ریزی). ', مطالعات منابع انسانی, 5(18), pp. 31-48. رهنورد, رامین. تأثیر انگیزه درونی و بیرونی بر انتقال دانش (مورد مطالعه: موسسه عالی آموزش و پژوهش مدیریت و برنامه‌ریزی).. مطالعات منابع انسانی, 1394; 5(18): 31-48. کارشناسی ارشد مدیریت اجرایی، دانشگاه تهران، پردیس بین الملی ارس. امروزه در فضای ابر رقابتی، تسهیم دانش میان کارکنان سازمان نه یک گزینه، بلکه نوعی ضرورت استراتژیک است. هدف این مقاله آزمون اثرات انگیزه درونی و بیرونی کارشناسان موسسه عالی آموزش و پژوهش مدیریت و برنامه‌ریزی در انتقال دانش است. این تحقیق از نظر هدف شناختی یک تحقیق کاربردی و از نظر روش‌شناختی یک تحقیق توصیفی-میدانی است. جامعه آماری این پژوهش شامل 100 نفر از کارشناسان موسسه مذکور بود که با توجه به جدول مورگان نمونه آماری 80 نفره به روش تصادفی نظام‌مند انتخاب و پرسش‌نامه‌ها میان آنان توزیع شد. برای سنجش روایی محتوایی پرسش‌نامه، از نظر خبرگان و برای سنجش پایایی پرسش‌نامه از آلفای کرونباخ استفاده شده است. نتایج تحقیق مبتنی بر تحلیل رگرسیون خطی نشان می­دهد که انگیزه درونی افراد در انتقال دانش میان کارشناسان نقش کلیدی داشته و انگیزه بیرونی در انتقال دانش معنادار نیست. از این­رو، برای تسهیل در فرایند انتقال دانش میان کارشناسان، ضروری است برای تأمین حس استقلال در افراد، ارتقای اعتماد به نفس در آنان، ترویج فرهنگ صداقت، و ایجاد حس عضویت در سازمان، سازوکارهای لازم طراحی و به اجرا گذاشته شوند. Amabile, T.A., (1993). Motivational synergy: Toward new conceptualizations of intrinsic and extrinsic motivation in workplace. Human Resource Management Review, 3 (3), 185–201. Ames, R., and Ames, C. (1990). Motivation and Effective Teaching. In B. F. Jones and L. Idol (eds. ), Dimensions of Thinking and Cognitive Instruction. Hillsdale, N. J.: ErIbaum. Berkes, F. (2009). Evolution of co-management: Role of knowledge generation, bridging organizations and social learning, Journal of Environmental Management, Vol. 90, pp.1692–1702. Brookes, N.J., Morton, S.C., Dainty, A.R.J., and Burns, N.D. (2006). Social processes, patterns and practices and project knowledge management: A theoretical framework and an empirical investigation, International Journal of Project Management 24, 474–482. Chi Pie, J. (2006). An Empirical Study of the Relationship between Knowledge Sharing and IT/IS Strategic Planning (ISSP), management decision, 44. (1), 107-108. Cruz, N.M., Pe´rez, V.M., and Cantero, C.T. (2009). The influence of employee motivation on knowledge transfer, Journal Of Knowledge Management, 13, (6), 478-490. Davenport, T. and Klahr, P. (1998). Managing customer support knowledge, California Management Review, 40, 195-208. Fugate, B.S., Stank, T.P., and Mentzer, J.T. (2009). Linking improved knowledge management to operational and organizational performance, Journal of Operations Management, 27, 247–264. Hurley, Tracy A. and Carolyn W. Green (2005). “Creating a Knowledge Management Culture: the Role of Task, Structure, Technology, and People in Encouraging Knowledge Creation and Transfer”, Proceedings of the 2005 Midwest Academy of Management Conference. He, W., Qiao, Q., and Kwok-Kee W. (2009). Social relationship and its role in knowledge management systems usage, Information & Management, 46, 175–180. Hendriks, P. (1999). Why share knowledge? The influence of ICT on the motivation for knowledge sharing, Knowledge and Process Management, 6 (2), 91-100. Hersey, P. and Blanchard, K. (1998). Management of Organizational Behaviour: Utilizing Human Resources, Englewood Cliffs, New Jersey: prentice-Hall. Jasimuddin, S.M. (2008). A holistic view of knowledge management strategy, Journal of Knowledge management, 12, ( 2), 57-66. Jiacheng, W., Lu, L., and Francesco, C.A. (2010). A cognitive model of intra-organizational knowledge-sharing motivations in the view of cross-culture, International Journal of Information Management, 30, 220–230. Keng-soon, S. (2006). Why Workers Share or donot Share Knowledge: A Case study, Ph.D. Thesis, School of Education, Indiana University. Kwok; S.H., and Gao, S. (2005). Attitude towards Knowledge Sharing Behavior, The Journal of Computer Information Systems, 46 (2), 45-51. Lang, J. C. (2001). Managerial Concerns in Knowledge Management. Journal of Knowledge Management, 5( 1), 43 - 57. Lin, H. F. (2007). Effects of Extrinsic and Intrinsic Motivation on Employee Knowledge Sharing Intentions, Journal of Information Science, 33 (2), 135-149. Lin, W.B. (2008). The exploration factors of affecting knowledge sharing – The case of Taiwan’s high-tech industry, Expert Systems with Applications, 35, 661–676. Matzler, K., Renzl, B., Muller, J., and Herting, S. (2008). Todd A. Mooradian, Personality traits and knowledge sharing, Journal of Economic Psychology, 29, 301–313. Nonaka, I. & Takeuchi, H. (1995). The knowledge-creating company. New York: Oxford University Press. Perry, J.L. and Porter, L.W. (1982). Factors affecting the context for motivation in public organizations, The Academy of Management Review, 7(1), 89-98. Richter, A. Niewiem, S. (2009). Knowledge transfer across permeable boundaries: An empirical study of clients’ decisions to involve management consultants, Scandinavian Journal of Management, 25, 275—288. Robbins, S .P. (1997). Organizational Behavior: Concepts, Controversies & Applications, NJ: Prentice-Hall. Ryan, R.M. and Deci, E.L. (2000). Intrinsic and extrinsic motivations: classic definitions and new directions, Contemporary Educational Psychology, 25(1), 54-67.